Prepare for your initial Driver Certificate of Professional Competence (Driver CPC) with this official book for professional bus and coach drivers. This official guide has been prepared in close consultation with a working group of industry experts and experienced PCV trainers from GoSkills, First Group, Arriva and East London Bus Group, so it is up-to-date with current industry thinking. 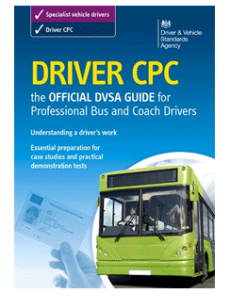 You may also be interested in The Official DVSA Guide to Driving Buses and Coaches, which provides all of the information you need to obtain – and retain – your Driver CPC qualification.